With some very modern day clothes it it sometimes safe to assume that instead of costumes being recycled and reused again, that they were probably purchased and just happened to be purchased more than once. 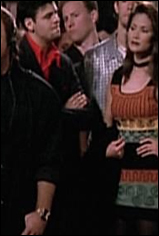 That being said, there is a very real possibility that this is the same dress because of the fact that both The Nanny and The King of Queens are CBS productions and therfore may pull from the same wardrobe department. It's also notable that this dress, clearly a product of the early 90s (my mother actually owned a copy of this dress) would be around in 2000 for purchase - so of course it was pulled from wardrobe somewhere. 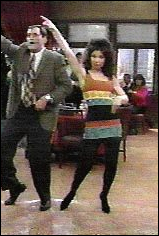 The possibility that it was pulled from a section that had been used for The Nanny is highly possible, assuming the original was not sold, auctioned or not still in the posession of Miss Drescher.